Weak, thin hair with a tendency to hair loss and receding, hair that needs strengthening and nourishment. The plant stem cells treatment stimulates hair to grow back. For every hair type. Thanks to the content of the plant stem cells called PhytoCellTec™ Malus Domestica, the serum stimulates hair growth, delays and eliminates the hair ageing process by protecting stem cells in hair follicles. B vitamins (B3, B6, biotin) hinder excessive hair loss and stimulate growth of new hair, as well as facilitate proper functioning of the scalp. Chicory extract energizes the scalp and hair and protects against destructive impact of free radicals. It is an inhibitor of the enzyme 5-alpha reductase, a substance that is responsible for androgenic alopecia. Thanks to the high content of zinc, calcium and magnesium, red algae extract makes hair stronger, prevents its breakage and excessive hair loss. This protective and moisturizing complex as well as honey intensively moisturize and regenerate the scalp and hair. D-Panthenol lends hair elasticity and volume. It also prevents hair frizz. Hair becomes strong, full of shine and more resistant to damage. It looks healthy and is easier to comb. It is also thicker, more resilient and less susceptible to adverse conditions. Hair loss is significantly reduced. Apply the content of 1 full tube on the scalp in the evening on a daily basis. Massage it gently in for 2-3 minutes. Do not rinse off! The scalp massage will improve blood circulation and allow active ingredients to nourish as well as strengthen the hair follicles and roots. It is recommended to use the product in the evenings on a daily basis. Due to the high content of natural active ingredients, hair may appear weighed down and stiff. However, it does not affect the efficacy of the treatment. It is recommended to wash hair with Seboradin FitoCell in the morning and style it as usual. In order to obtain the best results, use the content of 1 tube a day for at least 3 months. 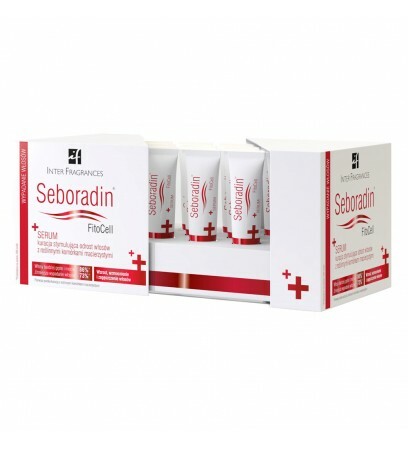 It is recommended to use the full treatment with Seboradin FitoCell Shampoo and Mask.